Many see storing food as a necessary investment for themselves and their family. Knowing which foods to store and how long they will last are the key elements to making the most on a food investment. These 11 food items can last a lifetime if properly stored. Did you know that with proper storage techniques, you can have a lifetime supply of certain foods? Certain foods can stand the test of time, and continue being a lifeline to the families that stored it. Knowing which foods last indefinitely and how to store them are you keys to success. The best way to store food for the long term is by using a multi-barrier system. This system protects the food from natural elements such as moisture and sunlight, as well as from insect infestations. Typically, those who store bulk foods look for inexpensive items that have multi-purposes and will last long term. 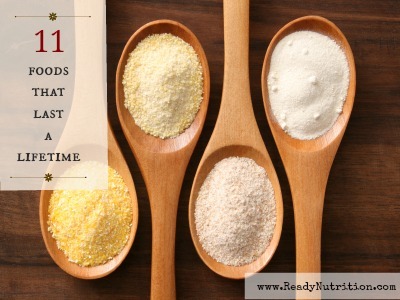 Listed below are 11 food items that are not only multi-purpose preps, but they can last a lifetime! Honey never really goes bad. In a tomb in Egypt 3,000 years ago, honey was found and was still edible. If there are temperature fluctuations and sunlight, then the consistency and color can change. Many honey harvesters say that when honey crystallizes, then it can be re-heated and used just like fresh honey. Because of honey’s low water content, microorganisms do not like the environment. Although salt is prone to absorbing moisture, it’s shelf life is indefinite. This indispensable mineral will be a valuable commodity in a long term disaster and will be a essential bartering item. Life would be so boring without sugar. Much like salt, sugar is also prone to absorbing moisture, but this problem can be eradicated by adding some rice granules into the storage container. Uses: sweetener for beverages, breads, cakes, preservative, curing, gardening, insecticide (equal parts of sugar and baking powder will kill cockroaches). Wheat is a major part of the diet for over 1/3 of the world. This popular staple supplies 20% of daily calories to a majority of the world population. Besides being a high carbohydrate food, wheat contains valuable protein, minerals, and vita­mins. Wheat protein, when balanced by other foods that supply certain amino acids such as lysine, is an efficient source of protein. Essentially, dried corn can be substituted for any recipe that calls for fresh corn. Our ancestors began drying corn because of it’s short lived season. To extend the shelf life of corn, it has to be preserved by drying it out so it can be used later in the year. Uses: soups, cornmeal, livestock feed, hominy and grits, heating source (do a search for corn burning fireplaces). This multi-purpose prep is a must have for long term storage. Adding these to your long term storage will not only add a variety to just drinking water, but will also lift morale. Instant coffee is high vacuum freeze dried. So, as long as it is not introduced to moisture, then it will last. Storage life for all teas and cocoas can be extended by using desiccant packets or oxygen absorbing packets, and by repackaging the items with a vacuum sealing. Although many of us prefer carbonated beverages, over time the sugars break down and the drink flavor is altered. Non-carbonated beverages stand a longer test of time. And, as long as the bottles are stored in optimum conditions, they will last. Non-carbonated beverages include: vitamin water, Gatorade, juices, bottled water. White rice is a major staple item that preppers like to put away because it’s a great source for calories, cheap and has a long shelf life. If properly stored this popular food staple can last 30 years or more. Because bouillon products contain large amounts of salt, the product is preserved. However, over time, the taste of the bouillon could be altered. If storing bouillon cubes, it would be best repackage them using a food sealer or sealed in mylar bags. Powdered milk can last indefinitely, however, it is advised to prolong it’s shelf life by either repackaging it for longer term storage, or placing it in the freezer. If the powdered milk developes an odor or has turned a yellowish tint, it’s time to discard. Uses: beverage, dessert, ingredient for certain breads, addition to soup and baked goods. Don’t you mean “baking soda”? Good post. I always store my powdered milk in the fridge…keeps it from getting that “off taste”. The baking soda you are talking about is this for the cockroach killer or for something else, I am not clear on this. I don’t know if there is a different Baking Soda used in Science. But the box we buy in the store is what is used. Arm and Hammer is the best known brand, but store brand works just as well. I mostly use it for cleaning, and although it can be a bit messy, especially when doing the weekly deep cleans in the Kitchen and bathroom. The pay off is super easy cleaning after. I did mean baking soda! Thank you for letting me know. I was writing this last night after a long day and made a mistake. I like the idea of storing your powdered milk in the refrigerator. I will have to start trying that. If you want to store flour, wheat, rice in a container you just add a few wax candles in there. It will keep the little bugs out. I also baked the flour, wheat, mielie meal (maze meal) in the oven on a baking tray for about 5 to 10 minutes. Then cool it down and store it in air tight containers. Will stay fresh and bug free for a long long time. I have heard about baking your prep items to kill off bug infestations. Similarly, some even put their food stuffs that they are going to store away into the freezer for a day or two to also prevent bug infestations. Not to quibble about details here but technically salt and baking soda are not foods but additives. Totally essential in certain circumstances (I am not belittling their value–just suggesting that they don’t meet the criteria for “food”). Anyway–really good information and appreciate the post. Salt is a food since it is essential for life. Without salt, you cannot make stomach acid, and cannot properly digest food. Without salt and other essential minerals you will not stay healthy. P.S. as a beekeeper (and a beekeeper instructor at the John Campbell Folk School (folkschool.org) I can vouch for honey as an extremely valuable food source for storage. Has everything going for it. High calorie, indefinate storage life, valuable trade item. Just an additional thought. And beekeeping is quite easy to learn if you are the least bit interested–most areas have beginning beekeeping classes during the Winter (for the Spring startup time for beekeeping) that are usually free or close to free. And one final thought. YOU can keep bees almost anywhere. My son had three hives in his back yard in Denver. What about chickpeas? How long would these last? Would you recommend storing them? 5 years too later but I can vouch for chickpeas. Have had cans in storage and then used after 3 years. One of my very favorite foods. Better then tunafish when adding mayo and mashing! Unfortunately you will die if this is all you have to eat for any period of time. You need protein and fat to survive; your list consisted mostly of carbohydrates and some minerals. I agree with the corn. You should stock up on dried and canned beans, powdered whole milk, powdered whole eggs, oil (olive, corn, sunflower, peanut), nuts (peanuts, almonds, cashews), dried fruit (figs, apricots, tomatoes). You can survive on that stuff forever. Also: peroxide, aspirin, vitamins, mineral supplements, band-aids, gauze, soap, bleach. Charcoal, matches, batteries, light bulbs, an electric generator, an electric heater, and 150 gallons of fuel. Oh, and don’t forget the ammo. Hi you are definately on the ball!!! Great too see!!! I think a BBQ gril that burns wood if you have access to free wood, it would be great to cook on if you have no power. You are correct that this is an incomplete list for preparedness and long term survival. Note, however, that the article has a theme: Foods that can last a lifetime. The items that you mentioned do not last as long and, therefore, don’t really have a place in this article. We’re talking outdoor survival, not a night at the Hilton. 150 gallons of fuel? One of the most important things to have is white vinegar and cider vinegar…..my goodness…it is amazing how many things it cures including bad burns or rashes etc. It is also good for disinfecting drains and clearing up mold and mildew. 2 years too late but i concur. 2 tablespoons of apple cider, honey, ginger in water keeps the doctor away! Great for the feet, hair as well. So many uses! I also bought dried seeds for plants to trade. I bought essential oils like anise oil, which will numb things for instance a tooth or a babies gum, oil of clove, also used by my dentist to numb an area. There are other oils that are great as well and last forever. I think the other I bought was oil of Eucalyptus. I can’t remember what that was used for. But I also printed out info about them because I keep a binder with medical information. I love it when I see people use their head when it comes to preps 🙂 …. There is a ebook that explains in detail (like an herbal cook book) how to prepare fresh and dried herbs for over 1200 medicinal uses. “Surviving with Nature- Natural Treatments” by Melissa Bull…. worth it to print it out and keep with your preps…. I too also have a SHTF- off grid living binder (well it has turned out to be a small library lol) Pass the word though…. because if SHTF then there will be little to no pharmaceuticals for those who depend on them. if you think you need plants to survive, you are so screwed. you need a few acres of filled farmland and to water the crops for 4 months. you better put a few horses in your bug out bag and hay for them too. Coconut oil stores indefinitely and is very healthy for you. You can purchase it by the bucket. Get the wide-mouth 1-qt. canning jars. Many vacuum sealers have an attachment for evacuating the air from those jars. Put up all dry foods this way and bugs will never reproduce with no oxygen. Items will remain fresh longer. Later, you use the jars for canning or for trade. I agree. I am in no way saying that a person should bulk up on only these 11 items. A well rounded diet high in vitamins, proteins and carbohydrates is essential when planning a long term food storage. The purpose of the article is to educate others on which foods last the longest if properly stored. Chickpeas are considered part of the legume family, so they should be stored like one would store other beans. Store in a cool, dry place for one year. This shelf life can be extended significantly if you use mylar bags and oxygen absorbers to repackage the chickpeas in. I have about 150 lbs of white rice stored in vacuum sealed bags. But I really prefer the taste of brown and wild rices. How do these rank in storability? Look into native harvested wild rice. It is parched (low heat drying) to crack the hull, naking it suitable for long term storage. I prefer the taste of brown rice as well, and it is a healthier choice. Brown rice has 15 essential nutrients, including B-vitamins, niacin and potassium. However, this type of rice should not be considered for long term prepping. Brown rice will go rancid. If properly stored, it could last for about 2 years, so it could be considered a good short term food supply choice. What about dried dog food? Pemmican is red meat that is dried, ground to small flakes and mixed with an equal part of tallow at a specific temperature. The Plains Indians made it out of bison and used it as a trade good. When kept out of sunlight and away from moisture it will last about 20 years when prepared properly. Reputedly it will maintain health indefinitely. We lived on a boat for a year and stored food for the entire year. One thing we did was to get pickle buckets with tight fitting lids and filled them with grains – millet, brown rice, corn etc. Place pieces of dried ice in the bucket and seal the lid. The CO2 kills all bugs and keeps it fresh until you open the buckets. We kept some of them for five years and they were still good. You forgot sproutables. They may not keep as long, but you should have them for vitamin C if ever TSHTF. Although I am a firm believer in having sproutables in my short and long term food storage, I did not add these to this list because certain seeds have different lifespans and they need specific storage guidelines in order to stay viable. Canned food = 2 years from manufacture date (some are 3 years). Dry food = 1 year from manufacture date (except Lamb-6 mos). Treats = 1 year from manufacture date. For more information about your specific pet food brand, contact your local pet food retailer or the manufacturer. For a long-term supply over three years, you can store bulk foods that you can make into pet food. Bulk quantities of grains, like wheat and corn are fairly inexpensive and have nearly unlimited shelf life. Add protein sources, such as dried meats and eggs, as well as vitamin, mineral, and protein supplements your stockpile to assure adequate nutrition. (Vitamin C can be stored almost indefinitely.) Store bags/boxes and bulk grains in sealed cans or plastic buckets. I have purchased and used this product, and my dog loves it. It is pricy, but when I think of the alternative of the added trauma in a SHTF scenario of losing my dog because I didn’t prep for him, well, it becomes a small price to pay. The expiration stamp on the bag of chicken meat I have on hand is 2014. I keep a container of this in the car when we go anywhere with him, along with MRE’s and water. I rotate this just like our food supply. Thanks for the heads up on the dog food suggestion! I’m going to definately check it out. Another suggestion for long term dog food is to store extra canned meats and canned soups, and rice for our canine friends. Be careful with dogs that have sensitive stomachs. People please get real here your dog or cat will become your first starving meal not something you will be feeding it will be feeding you, people all over the world eat dogs horses cat’s goats and other what we call pet’s I don’t think any of you people have ever really been really hungry before and as bad as It may sound your dog will be a great meal your neighbor who just got shot by someone while trying to protect his food source might be your next meal it has happened before and the people who were stuck on that mountain later said human meat taste very good, I hope it never comes down to that but please don’t waist your money trying to feed your dog unless your going to plan on eating it later, If you ever get hungry enough you will be surprised what you will eat. Something to consider… animals, primarily in this instance dogs; were domesticated for several purposes. They were/are useful members of a family. 1. Security, the scent of a dog keeps many animals away, even a small dog can alert you to intruders. 2. Dogs can find water 3. Companionship 4. Keep you warm at night. 5. Some breeds will even hunt or provide assistance when hunting. 6. Pets can also provide positive morale for children. 7. Some dogs will protect you instinctively and deter people that may do you harm. In conclusion I consider my dogs to be an important asset and will do everything thing I can to provide for them. I vacuum seal dry dog food with oxygen absorbers to extend shelf life. Rotating of course. Name brand grocery store dog food has more preservatives and will last longer. Uhh yeah, that’s why we plan ahead and keep our pets fed as well, so we will not be eating them. Apparently you miss the entire point of this site. One of my dogs is an excellent guard dog. In a survival situation where law and order has broken down he’d be an asset rather than a liability. He can also retrieve any game birds we’d be able to shoot which would save us humans huge amounts of time and energy – and when food is scarce you don’t want to be wasting calories. Another dog is an excellent hunter. We’d be able to rely on him to catch wild rabbits for the family – or if it came down to it, rats, because no, I’m not surprised at what people will eat if they have to. So apart from the fact I love my animals like they’re family, as far as I’m concerned prepping food for them is also investing in the food security and personal security of the rest of the family. A large dog is also a good pack animal, train them now. Are you kidding me James? Dogs can be very beneficial in a SHTF situation and I’m not referring to making them your dinner. I’ve always heard that you do not eat working animals.ALL animals you mentioned are considered working animals. You are right for wanting to find reliable products to give you and your family clean drinking water. IMO, water is the most important item to have for emergencies. If you have access to fresh water and want potable water, you can use the boiling method, invest in purification tablets, chemically treat it (bleach) or distill it. If you are interested in reading more about this, I wrote an article about ways to store water for long term emergencies. I am going to invest in some rain barrel to collect rain water….I am also reading that if It must be purified first and strained for bacterial germs before you even boil it! Especially bugs and bird poop etc. which infect rain water but great for toilets and washing (again need purification) to use to wash body and dishes etc. Look into Dr. Gerald Pollack’s work on structured ware. That’s the type of water that is in our cells. Also, you can read online reviews of water filter systems and purifications tablets to find which product is best for you. Regarding long-term storage of canned dog food, I talked to a dog food company person about two years ago. He said that a 3-yr date stamped on the cans is just so that people will believe it. He said that in reality, unless the cans or contents are compromised, the cans will last indefinitely if kept in a cool dry place. Just a couple of comments. First, as to wheat and the dehydrated milk, there may be some people in your group (as there are in ours) who cannot tolerate lactose or gluten. One common malady these days, due to the diet in the U.S., is colitis or related diseases. Giving wheat to my daughter will kill her. For that reason, we have stocked up on a number of gluten-free items such as dehydrated potatoes, and a number of rices (including the white). Beans are great for protein, but deadly for colitis sufferers, so we have included lentils and chickpeas there. We agree with Angelo DePalma on the protein, hence the beans, chickpeas and lentils, and the ammo. As for water, we purchased the SafeWater jerrycan, which will give us 20,000 liters of clean water for drinking. That can obviously be supplemented with bleach and iodine treated water, and boiling, but it will also get your family-sized group through the first period and to your safe zone. Great Info!Lets not forget a portable Gas-Barbeque!! I saw no real mention of seeds.Lettuce,tomatoes ,etc. no mention of firearms(that would be in the top 5,food item or no))because if you can’t hang onto it your in deep trouble. I thought about adding seeds to the list, but decided against it at the last minute because I wanted to concentrate on food preparedness items that we each try and accumulate each month. Seeds would be a great item to store, and there have even been some ancient survival caches found that had viable seeds stored away. I did not add firearms and ammunition because this topic was based on food items. But, I do agree with the concept of if you can’t defend it, you don’t own it! Yes, turnips and seeds, you can add them to your dog stew. greens are an essential in my book. Can’t do much in summer due to heat in Texas. but fall & early spring lettuces all varieties & mustard, collard greens are a must & grow from Sept until may. a good source of food check it out You will like. Is there a way I can Print all of your ihfo and the comments people have made, so my husband can read them? Really enjoyed reading all of the info. I don’t have a print all button, but I will look into getting one for my readers. In the meantime, there is a print button on the right-hand side and underneath the title of every article. Thanks for your suggestion. Lol… you boys are going to have to figure out how to cook for yourself. The women are going to be busy too. I am in full agreement with the train of thought here. I don’t believe if but when TSWHTF!! We are putting up Sugar, Lentals, Black Beans, Wine, MRE’S, Vinerar, Salt, Powdered Potatoes, Condoments, Storing Fuel, Putting in wells, Get ready, The Time IS coming. Purify your water with Pool shock or just save $$$instead of buying liquid bleach. read packages carefully esp. ingredients and storage. be sure it does not have additives such as algecides. the purer the better – calcium hypochlorite.. 1 lb for $3-$4 will give you about 128 gallons of bleach for purifying water, cleaning, and sanitizing. I`ve never heard of using sugar and baking soda to kill cockroaches. If that works then that should be it`s ONLY use. White refined sugar is worse than nothing at all. It will make you fat and kill you. I strongly suggest you do a search on the dangers of sugar. Use brown sugar and honey. The purpose of this article was to show you which low-cost food items will last the longest in a long-term storage environment. While white sugar is used in fatty foods, it also has other uses. In fact, sugar can used for curing meats, preserving vegetables and fruits and also for making alcohol. So, usgar is a useful item to have for the long-term. Thanks for your comment. brown sugar is just white sugar with molasses in it for color and taste. like i said to tess for her info…brown sugar is just white sugar with molasses added. For an inexpensive good water filter go to waves4water they have two to choose from. I got the one that cleans more in a day so I can help out the neighbors. Gidday from Australia! Great article and interesting comments… slightly confused… what do you think will happen for you to need to save food? I heated pancake mix, flour, and cornmeal in uncovered quart jars for 2 hrs. @ 200 on cookie sheets—-removed, cleaned rims, and sealed. Got them out of the buckets that stored for a few months into jars that store for years. Where did you learn this you ask?? From a granny doing it for years and years. She does most all her dry goods; not me…jars are to precious. Does anyone know of a source to buy corn masa flour, in buckets, for long term storage? I haven’t been able to find a bulk supplier of corn masa. However, http://www.BulkFoods.com is a large supplier of food sources, you could look there…. I called around and was told they don’t do masa in long term storage cans or bucket due to the moisture content. I find this kinda odd because I can get corn meal and corn flour in cans. Maybe they just don’t think many people would buy it but my thinking is it’s a lot quicker to make tortillas than bread and many things could be wrapped inside a tortilla. I did find a recipe for tortillas using a mix of corn flour and white flour I plan to give it a try. We ordered waves4water last week and they arrive this week. We have a river within walking distance in our small town so ordered the community and several of the smaller ones. I hope we never need them but as we always say no matter what happens the Red Cross is not going to come here anytime soon. Masa is made with hominy that is made with lye. There is enough of the lye present to react with the metal of the can. If you are concerned about moisture, you might try the tip that was mentioned earlier of toasting the flour in the oven for a few minutes and letting cool before placing in buckets. If you are going to use cans, line it first with a cheap plastic bag. This holds true also for grits. Great post. Regarding storing water, I found that another water filter that works fantastic is the one made by Sawyer. If the SHTF, I imagine it would be hard to locate new ceramic filters for the other popular brands, so what is amazing about the Sawyer brand is that they even have a 1 million gallon guarantee on them which means that you virtually won’t ever have to buy any replacement filters for them. All you need is just an ordinary syringe to back wash it from time to time. Sawyer’s claim to fame is that their filters use the kidney dialysis technology which gives it a .1 micron pore size which is actually twice as small as .2 micron ceramic based Berkey or Katadyn filters. @ Mike – You might want to look up how they make brown sugar, I think it will shock you. I’ll just tell you – they add molasses to fully refined white sugar. I’ve watched cane sugar be processed to white sugar the worse part is when they bleach it by bubbling sulfur dioxide through it. The end product is nealry 100% Sucrose which is a naturally occurring sugar. Now if you want to look up how they engineer High Fructose Corn Syrup and how the end product is not Sucrose but a single bonded Glucose-Fructose which does not get processed by the body in the same way as sucrose does even if it is composed of the same building blocks. Great article, Tess. I look forward to your posts. HFCS is the most widely used junk, and because of the high fructose content, it isw NOT good for our livers. It raises triglycerides, is metabolized partly into uric acid (GOUT), increases fat storage and has helped make America one of the most obese nations! Most grocery store brown sugar is just what you have described but there really does exist REAL brown sugar (check out this link: http://www.wholesomesweeteners.com/ and look under their products link to see the variety of sugars available that still have their natural minerals and other nutrients intact) We have been using the Billington’s dark sugar for years and once you taste it you will find a way to budget for it! Granted we use very little sugar of any kind but it has it’s place in every day AND prepping uses. I will stick with raw honey for my main sweetener. A track record of thousands of years is something to be regarded. This list is a great start. I think you should add most beans, hard wheat(need grinder), rolled oats, pasta, white flour(yes, bleached), cream of tartar(for adding to the Baking Soda 1 to 2 to make baking powder as needed), green coffee whole beans(roast as needed). A better option to bottled High Fructose Corn Syrup drinks would be powdered drinks made with sugar. There are ones that will store long term. All of this should be stored in Mylar bags with O2 absorbers of correct size and sealed with a hot iron. For extra protection you can put the mylar bags inside of food grade 5 gallon buckets but that may not be necessary. Store this way, everything I mention should keep for at least 25 years when stored around 65F. This will form the staple of your long term food storage and supplement all that you should have in your well stocked and rotated pantry. If you wish to further extend this you can add professionally packaged long term storage meals from companies like Augason Farms but samsclub has 30 day buckets shipped for a reasonable prices. (I don’t work for either of them) You can add the rice and beans to many of the meals to add additional calories/extend them. Don’t wait start now, Mylar bags and O2 absorbers are not expensive and can be bought online from many sources. I find that eBay has a lot of sellers to choose from. Be sure that the O2 are big enough for your bag. I use 2000cc for my 5 gallon Mylar bags. Be sure that they are really 2000cc some sellers cheat – read their ratings and reviews. @MylarPro – Thanks for pointing out Sawyer. 1 Million gallons guarantee and they have models that filter out viruses too. Long term that gives you potable water without always needing to boil it. I’m going to be picking up their SP190 bucket kit model that attaches to a bucket and provides 5 gallons in under 45 minutes. Thanks again, useful information. Is it necessary to repackage cold cereals (cherrios, lucky charms etc) for long term storage or packaged rice/pasta products (uncle bens/pasta)? Is the current packaging sufficient? Great question! I have re-packed cereals and boxed food items for extended emergencies. I usually wait until there is a sale at the grocery store and stock up. I tell people to do this because the packages that are our foods are put in are meant for short-term storage. They are typically sealed in flimsy or see through plastic packaging that is suseptable to the elements. Re-packaging them in heavy duty mylar with oxygen absorbers will prolong the oxidation process and keep them from being exposed to natural elements such as sunlight, air, bugs and moisture. Vacuum Sealing – When re-packaging dry goods such as cereal, remember to purchase the cereals that aren’t “delicate” and can withstand the vacuum sealing process if you choose to do so. Also, include an oxygen absorber to ensure the cereals stay fresh. Mylar Re-Packaging – This may be the easiest method of repackaging cereal. Further, you can store it in a smaller plastic container to protect the contents more. Remember to add oxygen absorbers! You can also find some recipes online to learn how to make your own cereals. Granola is an easy recipe to try with this. As none of that is what I consider food ( although it is somewhat edible and will barely keep you alive) I guess I will just have to go fishing and hunting and foraging. I hear the honey one quoted a lot as the only food that lasts forever, but sugar and salt are just as much (or little) a complete food. Gerald, honey does not have everything going for it, it has practically no protein and too high in sugar compared to its other nutrition. There was a girl recently who tried to live on mostly sugar water (Coca Cola) and she died. Honey is a condiment, you’d survive better on peanut butter as a condiment but not sure if it keeps. When storing your food I’m hearing alot of people using these hand warmers, do these things have to be used or not used before placing them into sealed bag? Yes, some preppers are starting to use instant hand warmers in lieu of oxygen absorbers. For those who haven’t heard, instant heat hand-warmers have the exact same ingredients as those mini oxygen absorbers. The advantage of using this product is that hand-warmers are cheaper and much larger. The drawback is that it isn’t considered food-grade and hasn’t been tested for use in food storage. For those interested in using this method, 1 hand-warmer is enough for a 5 gallon bucket. I am going to stick to using oxygen absorbers because they are rated for food contact, and have been tested for use in long term food storage. In all honesty, a pack of 100 oxy absorbers from ldscatalog.com is roughly around $12. That’s enough for 12-20 pails of dry food. $0.60 – $1.00 per pail is money well spent for my long-term food investment. If I package my Rice, Beans, Pasta, Corn, Wheat etc in Vacuum sealed bags with oxygen absorbers then in Mylar bags and lastly in food grade buckets with gamma lids….is it still possible to get weevils in my food? Will the larvae still hatch if there is no oxygen in the bucket? Can I use parboil rice, instead of white rice, will it last 25+ years? Thank you. There is always a chance for that, but it sounds like you are eliminating most of the factors that contribute to infestations. One thing you could do with food items like beans and rice is to put it in the freezer for a few days to kill off any insect eggs that happen to be on the food source. But, as long as you take the necessary steps to protect your food investment and store the food in a cool, dry area, then your supply should be well protected. Just a little aside. We all know what SHTF means, but I have a good synonym. An Electrical Engineering Professor named Boudreaux (real name) once responded to a students really dumb question with “Where were you when the SHIP HIT THE SAND.” WE all know what it implies, but it can still be used in polite company. Just sharing. @CajunMan – That’s great. I have never heard of that one before. Thanks for sharing. I did not read every post but I don’t recall anyone saying anything about cooking all this food. I live in a wooded area so I keep a wood burning BBQ for just that reason. We use the propane to grill on now but in an emergency we have the other. We have an all electric home no gas or oil in this area. Many times we lose our power so the grill comes in handy. I think vinegars should keep, since they’re essentially already turned wines, but vinegars can grow bacterial/fungal infections. Peanut butter will turn rancid eventually because of the oils. Oatmeal, treated like corn or wheat, should be safe to store for a long time. Will quinoa also keep forever if stored airtight as suggested? Very healthy grain, and very versatile. High in fiber and protein. Quinoa has a 15 to 20 year storage life when properly packaged in an oxygen-free environment. While it doesn’t last a lifetime, it is a good choice for long-term food storage. I liked this article. I would like to add that there is two things I find really lacking in sites which talk about storing foods for the coming bad times. One is the importance of rotating food stores. I had the unpleasant task of disposing of a large food store that had not been rotated. Most was stored in airtight plastic pails. But it was over 9 years old and rancid. I have read of families building storage racks in the walls of their homes. Canned goods are put in through a slot at the top and taken out through a slot at the bottom. One could also use a system where canned or dry goods are placed into a shelving system at the back and taken out in the front. Using this system you could store healthier versions that go rancid quicker. The other topic I rarely if ever see addressed is storing your food in sizes relevant for your particular needs. It isn’t of much benefit to have a three month supply of rice stored if it is in one container. It is better to store these in weekly use amounts. It may be a bit more expensive upfront. But when you are relying on your food stores to survive; you do not want those stores to go bad before you get them used up. A friend gave me an LDS #10 can of dried apple slices. There are just 2 of us here. Humidity has been higher than usual lately and the remaining slices are already stuck together. Do I separate them into small mylar bags with absorbers to store them longer? Also, what are people going to do with wheat? Do they all have manual grinders? B – Yes, to prolong your freeze dried foods, you could separate them into smaller Mylar pouches w/ oxygen absorbers. This also makes it easier to incorporate them into your food pantry. With regard to wheat, it would be a good idea to have a manual grinder of some sort in case you find yourself in an off-grid situation. However, you can easily incorporate wheat berries in your diet. Wheat is a prepper favorite because of its versatility.You can sprout it for additional vitamin and nutrition, make a hot cereal with it, add it to soups, use it as a side dish similar to rice or grind it up to make bread. You can read more about the nutritional aspects of wheat here. I have, what I consider, a decent vacuum sealer from Costco, but it will not seal a Mylar bag. MY question is it really necessary to pull a vacuum if I’m using plenty of O2 absorbers? Also, my Mylar doesn’t want to seal. Should I have the iron on high? 1 Gallon water is disinfected by 8-16 drops of regular household bleach (visually about 1/4 of a teaspoon) – double that for cloudy water. Shake and let stand 30 minutes. One teaspoon will disinfect 5 gallons. Immediately after treating, water must initially have a slight smell of chlorine. If it does not – repeat the process. I would encourage people to use the least possible GMO products in their food storage, It will take extra time to find but I feel it will be worth it in the long run. I am not a big supporter of Monsanto and its GMO experiments with our health and lives. I don’t get it, honey and powdered milk are suppose to last indefinate, why are there 1-2 years expiry date on store bought ones? Even though they claim to be 100% pure honey. I believe that store bought honey is pasteurized and most often stored in plastic containers, therefore they do have a shelf life. Whenever possible buy only raw honey. Honey is best stored in glass canning jars with tight fitting lids. One more thing…….Do not buy honey from China! The FDA has rejected most honey from China due to pesticides and other chemicals that had been found in their product. I only buy locally grown honey. What about dry yeast for baking? How long will that last if vacum sealed? Joanne – active yeast will store for 12 months. After than time, the yeast activity diminishes and your baked goods won’t raise as well. You forgot boo’s and asp. Where do you get 02absorbers? You can purchase o2 absorbers online at prepping stores, through amazon.com or in bulk at food storage sites such as sorbentsystems.com. love this! Great information, and i used it for a project. Emergency Essentials has powdered peanut butter in vacuum sealed cans that have a 30 year shelf life. Great addition to your stock. Old farmstead knowledge for storing grains and beans: put dried Bay leaves in the containers. It keeps out bugs and adds no chemicals. Thank you so much for all the info! Am new to this as well although have been thinking about it since the ’70’s when pastors were THEN warning of the last days. Thanks! My Grandmother taught me years ago to put whole bay leaves in the containers that I story dry foods in. They are not expensive and I have found that if you get them from the ethnic section of a store, you get the exact same product for at least half of the price of the same bay leaves in the spice section. The only difference is the writing on the package is in Spanish. The bay leaves keep bugs out. It really works and does NOT change the flavor of any of the food, flour, cereal, or any dry product. Good list except that wheat, sugar and honey are contaminated foods, considered fake foods with no nutritional value but dangerously high in cancer-inducing toxins (fyi-more than 90% of the U.S. food supply is contaminated, rejected by other countries). There are, however, excellent sources of real, wholesome (organic) nutrients available in powder form that come in safe, resealable bags which can easily be stockpiled. You can find them in n u t s d o t c o m.
Something I don’t see people doing which I think will be invaluable. I bought a solar generator. I bought additional solar panels which can be daisy chained. I have 6 panels …there is a limit but I can run many household items off of the one generator including a crockpot, a grill (I mean like a Mike Tyson Grill), a small outdoor electric grill, a small fridge etc. You can’t run any large items like a kitchen stove but you can do pretty much anything within the maximum number of wattage. For instance a hair dryer requires more wattage than is recommended for the solar generator. But you can use a microwave, small cooking plates under a certain watts, an electric coffee pot etc. keep a lamp lit. Of course you would need to be careful in certain situations …..but if you have an interior room or can cover your windows you can use it without anyone noticing it. By the way, I hang the solar panels in a back corner of my condo…where I get good sunshine. so they are always collecting. I don’t need to worry about gas or electric to run it. they are not cheap but if you are handy you can make your own panels. Evone, Your Mormon friend is right. This is a great way to kill off any bugs that may be in your food sources. Dates, dates, dates. Have to get with pits. The de-pitted ones don’t have the shelf life of the ones with pits. No refrigeration needs and will last FOREVER!!! I think figs will last a really long time but I’m not sure how much energy they provide. Those little dates pack a serious energy punch. Dates are very yummy…. and they keep you regular too. Does ghee last awhile? Or coconut oil? Powdered milk is extremely unhealthy!!! Check Sally Fallon from the Weston A. Price Foundation for more info on how detrimental to human health powdered milk is. Just one add-on to your list (which is great, BTW) : pure vanilla extract. Keep in in a dark bottle, and it only gets better with age. At least that’s what I was told; I buy it by the quart and I still can’t keep it! The skills of wilderness survival can help make everything right again, when things go wrong. The guide highlights basic first aid, building a shelter, signaling for help, foraging for water and food, fire-making, edible plants and navigating through the wilderness. You can do a search on the internet and find local retailers that sell dry ice. Great tip, Marie! Thank you!